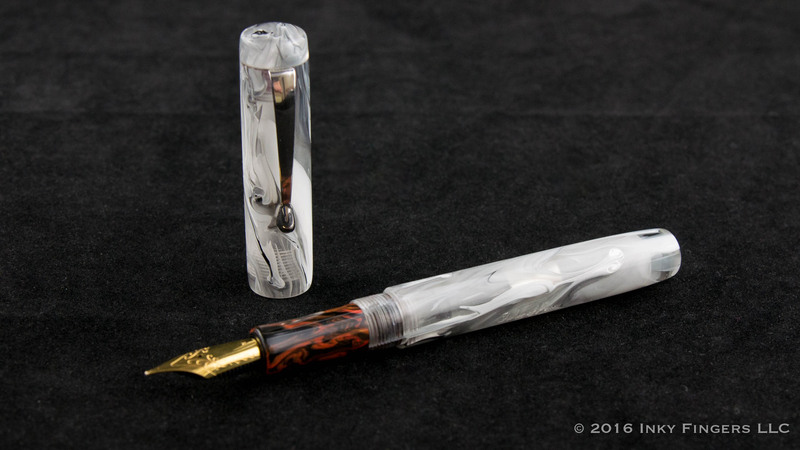 I met Carl Fisher and was introduced to his company, Fisher of Pens, for the first time at the Washington DC Pen Show in August of 2016. 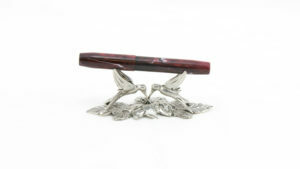 He and his lovely wife were sitting behind a table in the lobby of the hotel, behind an array of lovely handmade pens. 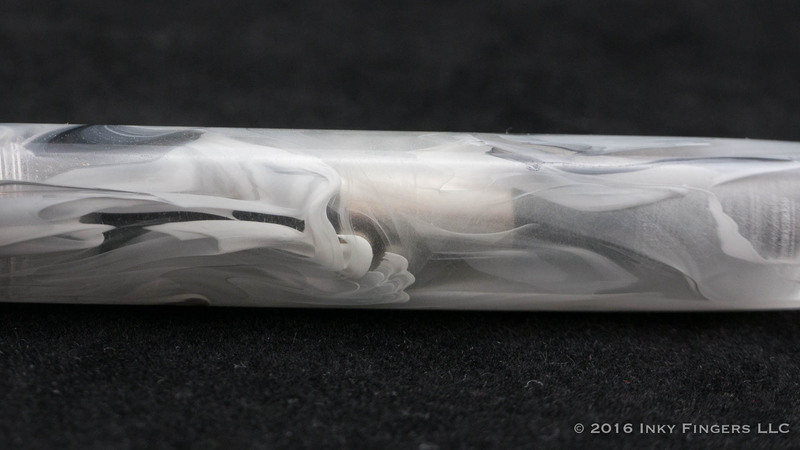 We chatted for a while (as I’m always excited to get to know about new custom pen makers) and looked over his wares. I knew I was going to end up picking up one of his pens during the show, but I had decided I was going to wait until Sunday to make most of my purchases, this year. When Sunday rolled around, I found Carl sitting in the main ballroom of the hotel (having been relocated from the lobby), and with a much smaller selection of pens than I had seen on the previous Friday. 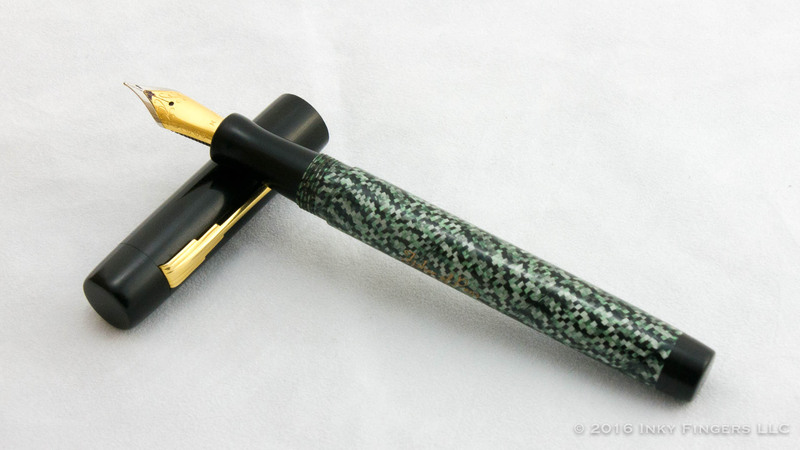 I perused his table, and found myself repeatedly drawn to one particular pen made of a vintage lizard skin celluloid and ebonite. I’m a sucker for green pens, and a sucker for celluloid, so this one was a true no-brainer for me. 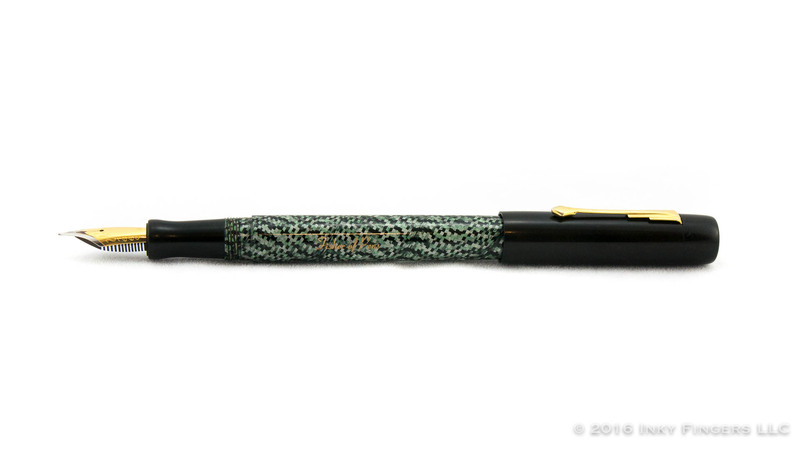 The pen is what Carl calls his Apollo model, and I think it highlights one of the things that helps the Fisher of Pens writing instruments stand out from a lot of other custom-made pens: the size. 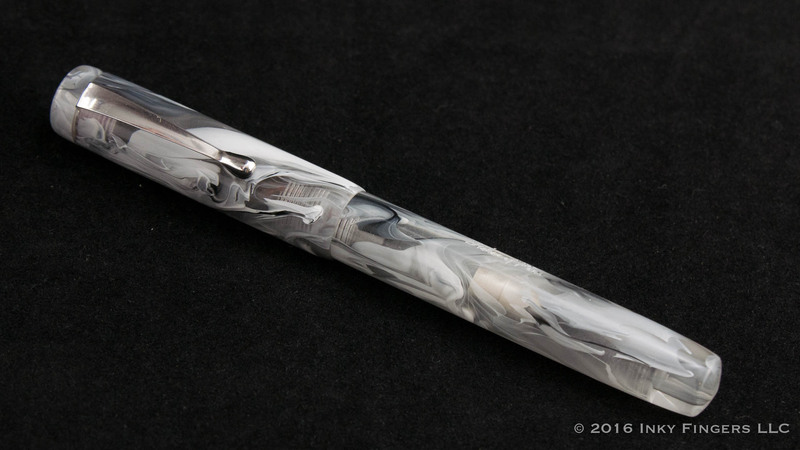 It seems that many custom pen makers opt to make large pens with relatively thick grip sections. 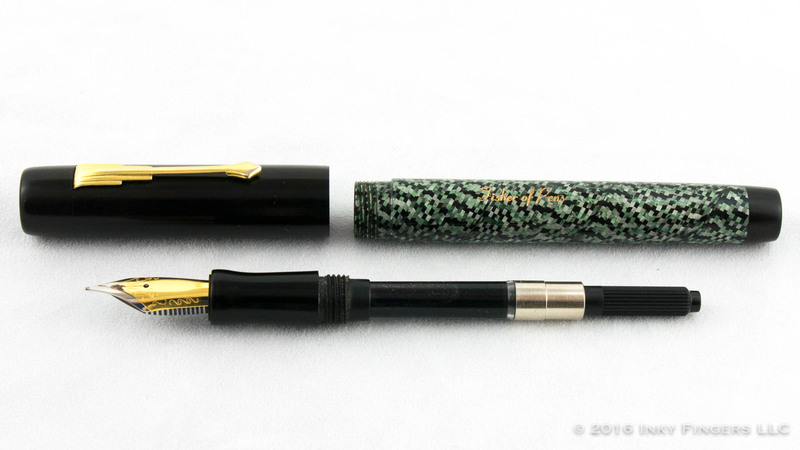 While I like both large pens and wider grips, I have heard from a lot of people who prefer smaller or shorter pens, or pens that are a bit narrower. Of the pens laid out at Carl’s table, they all seemed to be possessed of more moderate proportions: not so small that they would be unusable, but neither were they so large as to rule out those who don’t love the giant pens. The pen I purchased was something of a one-off, though. 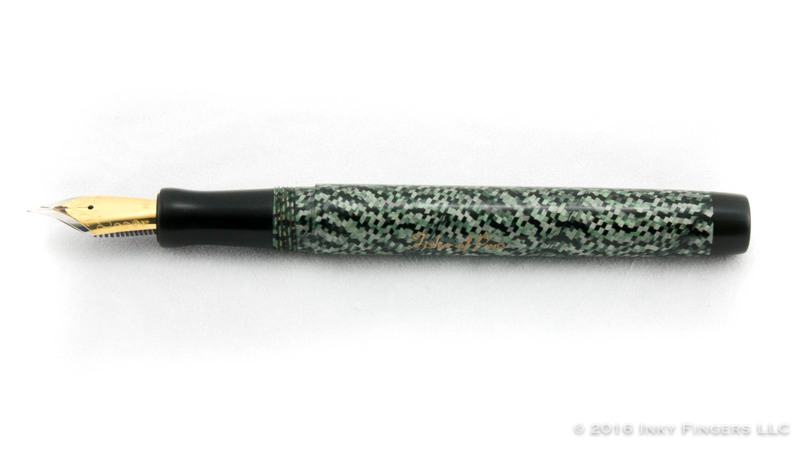 Vintage celluloid, like the green lizard skin celluloid from which my pen is made, is forever increasingly more difficult to get ahold of. And Carl warned me, when I finally decided on this particular Apollo, that he had no more of this material. 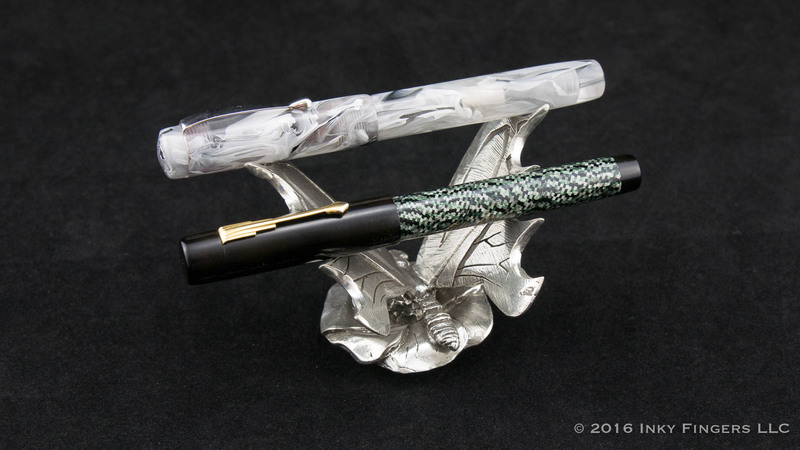 Concerned that reviewing a pen in a material that wasn’t available anymore was going to be an exercise in frustration for both himself and for potential customers, he asked if he could send me another Apollo for review and giveaway, which is how I was able to receive this Dragon Yin-Yang Apollo. 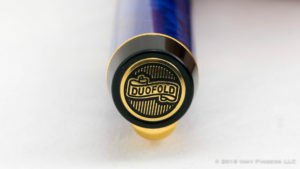 The Dragon version of the Apollo is a clean design that highlights the materials from which the pen is made. 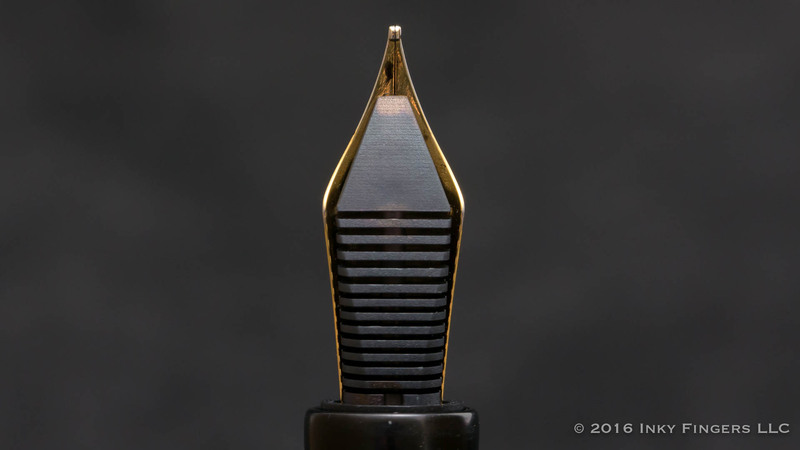 It is one of Carl’s stepped cap designs, meaning that the cap and the barrel are not completely flush when the cap is closed. The cap uses a finial with a slightly domed top to hold on a silver-colored, folded metal clip in a pretty standard clip design. The rest of the cap, made of the icy white, grey, black, and semi-transparent swirled material, is unadorned. 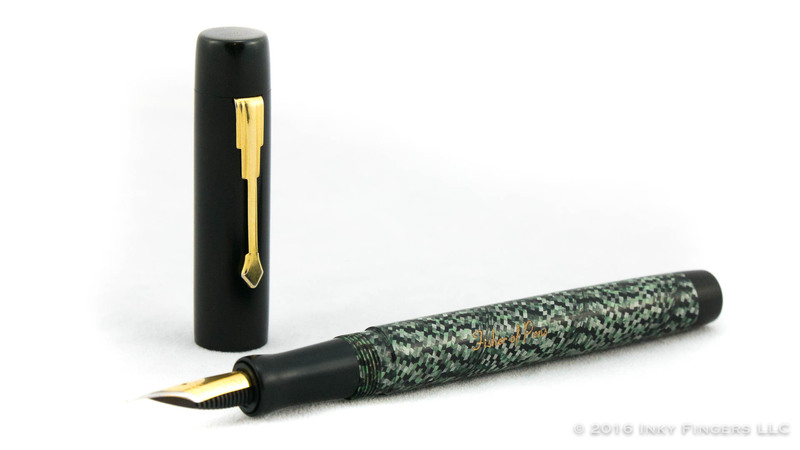 The barrel of the pen has a slight curve to it, ending with a domed terminus. 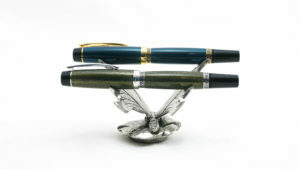 The Fisher of Pens of Logo is engraved into the side of the barrel. 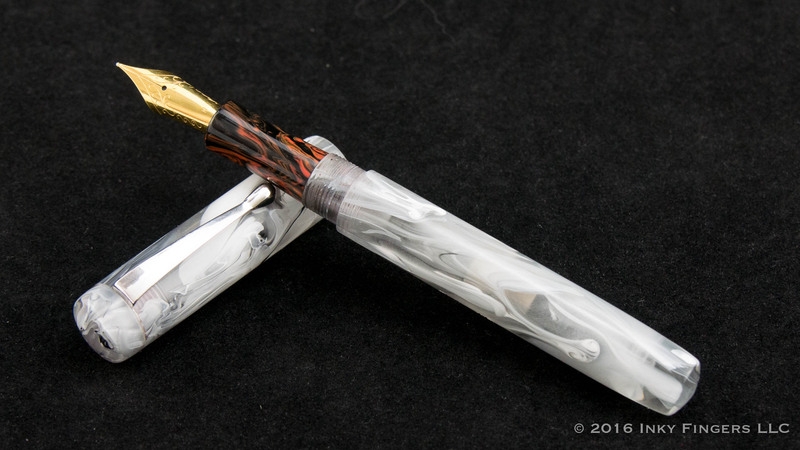 Under the cap, there is a section of bright, orange/red and black swirled acrylic which sets off the fire and ice theme of this pen quite nicely. The semi-translucence of the ice material means that you can see hints of the color peeking through the material, but not so much as to be distracting. 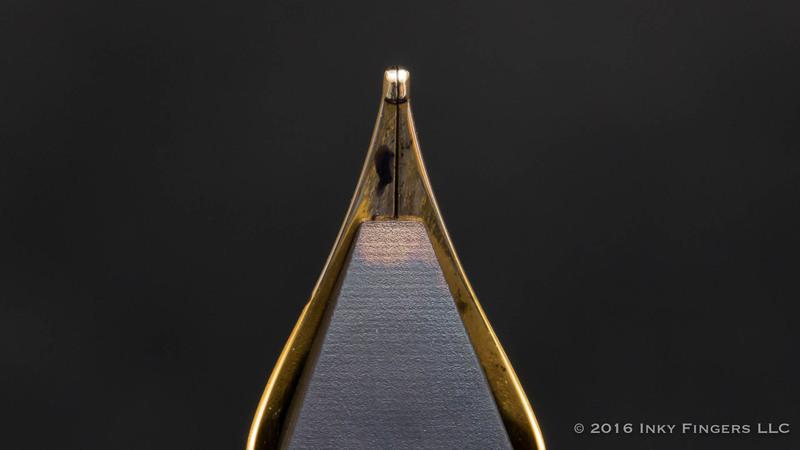 The section itself is nicely concave, with a very reasonable diameter of 10mm, making the pen much more appropriate for writers who like a more slender grip section. 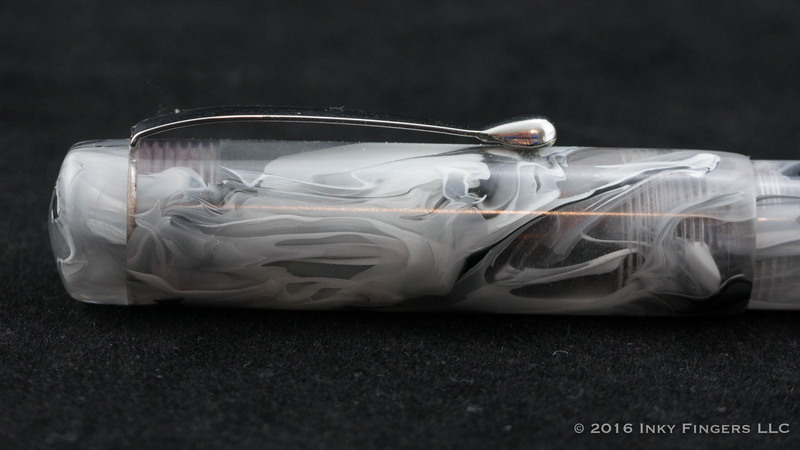 The pen is made almost completely of acrylics, and the threads are smooth and tight, meaning you could eyedropper the pen if you wanted to, and have a very interesting (and potentially quite lovely) eyedropper experience through the frosted acrylics. 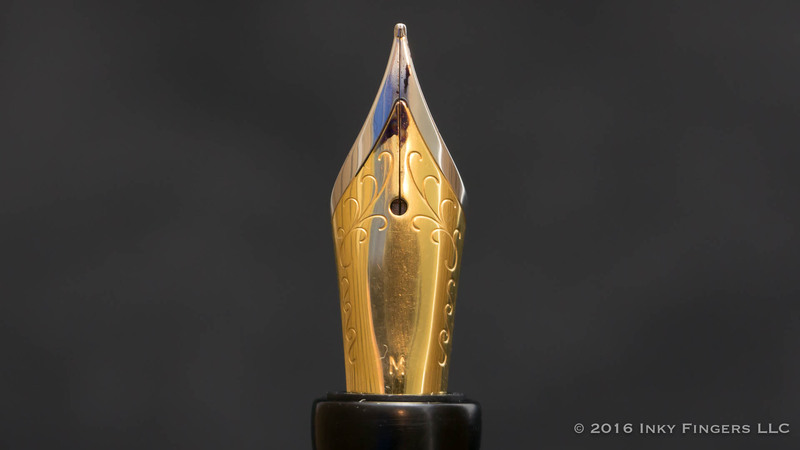 The pen utilizes a standard #6 Jowo gold-plated steel nib in medium. The nib is wet and smooth, just like I like them, and has been quite consistent for me, even having been inked and left sitting for several weeks in a row. The Green Lizard Apollo is a modified version of the Apollo design. 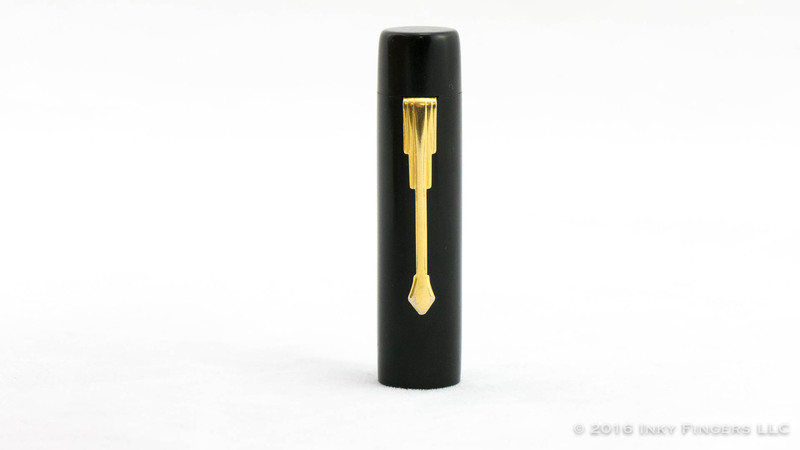 It has a slightly different profile meant to highlight the vintage nature of the material, with flatter end caps and an art deco-style clip in gold. 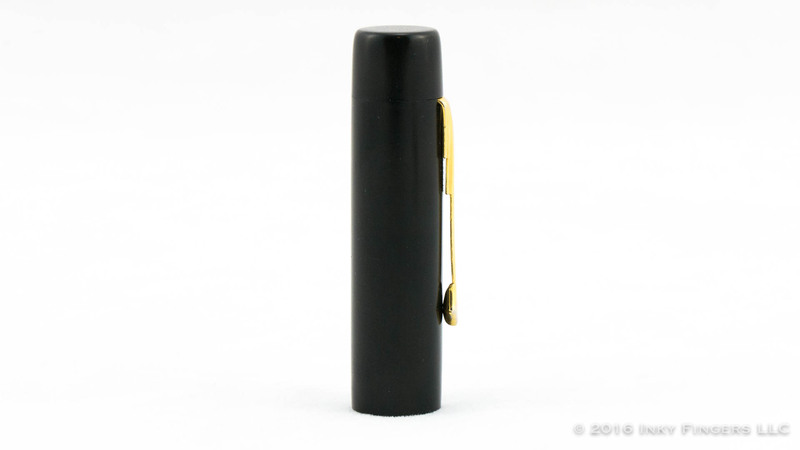 it also features a black cap and a black finial, also with a flat end. 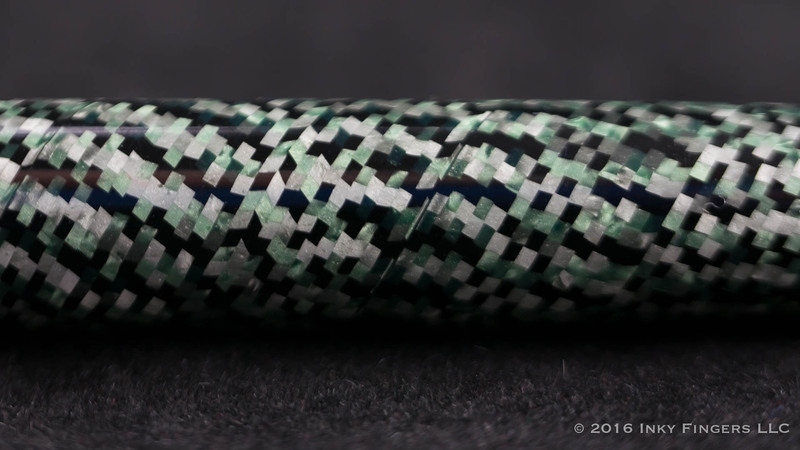 The lizard skin material is gorgeous, and quite unlike any material being made today. It’s my understanding that this material was made by creating it in sheets then wrapping it around a mandrel. Likely due to the limitations of the width of the rod stock, this Apollo is just a touch more slender around the barrel, but the section is basically the same. My Apollo came with an extra-fine nib, which if you know me, would not be my nib of choice. That being said, the EF was actually a very lovely writer. It was a wet writer (for an EF) so the line was a touch wider than you might expect for an EF, but it had a nice smooth finish with just a bit of tooth to keep your nib from slipping around the paper. I inked it up initially with Aurora Black, the first time I’ve used black ink in many a year, and it was a wonderful performer. 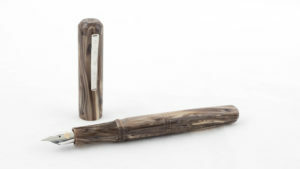 The pricing at Fisher of Pens is quite reasonable for custom-made pens. 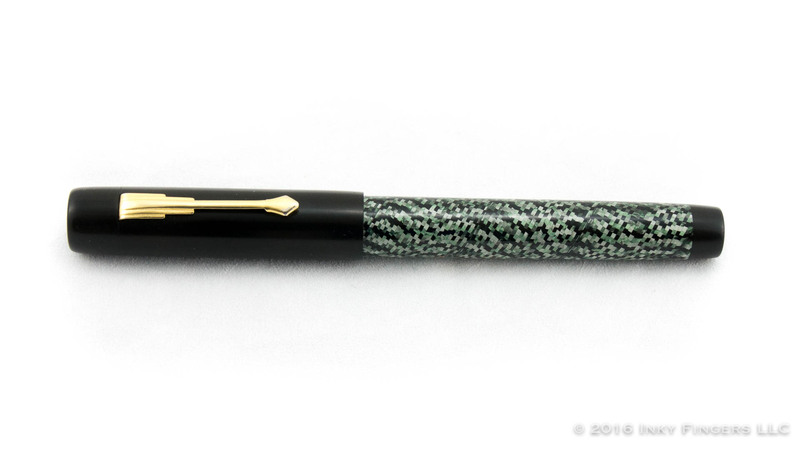 The base rate for many of his pen models starts as low as $200, with additional charges for nibs, specialty materials, or customizations. The Green Lizard Apollo was purchased with my own funds. 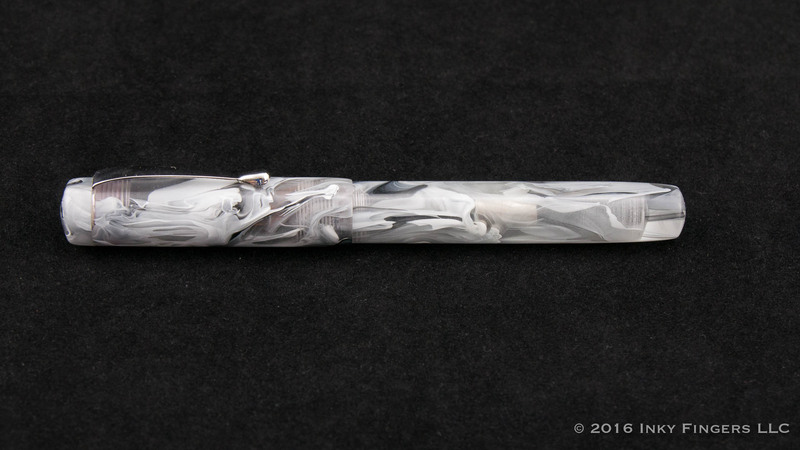 The Yin-Yang Apollo was provided by Fisher of Pens for review and giveaway to Pen Habit viewers (and to give viewers a more accurate indication of what a “stock” Apollo would look like. No additional compensation was provided. All opinions expressed herein are my own.